The Dhol Foundation make an amazing and mighty sound with spectacularly choreographed moves and a highly energetic performance. Led by the irrepressible and wonderfully charismatic dhol drummer Johnny Kalsi, their show features a vast array of musical styles: drum and bass, tabla, hip hop and bhangra … all delivered with great theatricality. The dhol is a traditional North Indian instrument made from a large wooden shell played with a cane on one side and a hard curved stick on the other. 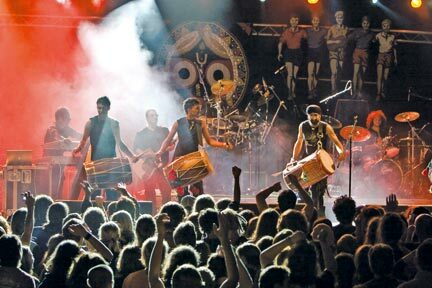 Vibrant and loud, the infectious beats rush through the sound of electronica elements together with folk traditions of song and dance of the Punjab. During the days leading up to this show, members of the Dhol Foundation (in conjunction with South Asian dance company Diversity Dance) will be working with students from Calder High School to produce new and exciting dance and music pieces. The concert will open with a performance of these works by the students and their mentors.